Oh man, I wish I would have thought, as a kid, to add “upcoming tests” to paper (other than letting it tumble about in my head!). 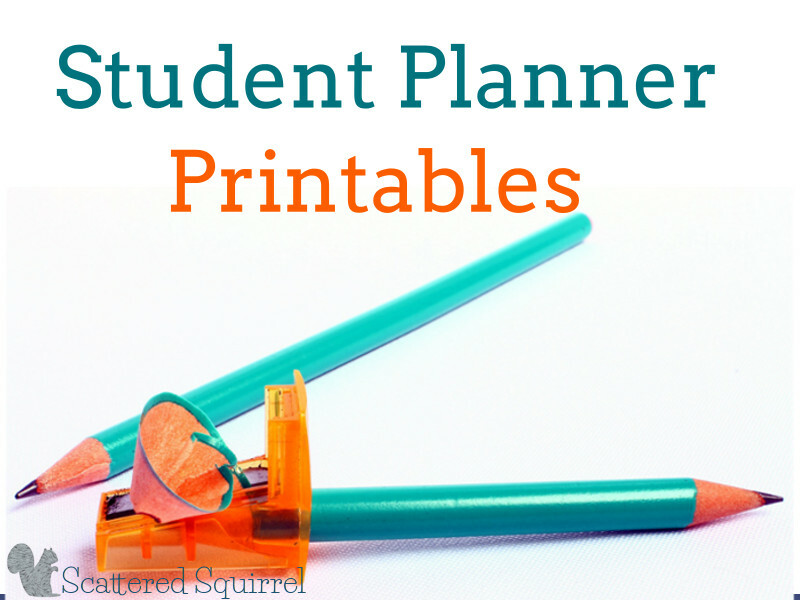 We got planners in middle school, but not in high school (much, much smaller district, so probably not cost efficient) – though I will say the planners in middle school were more fun than useful, but did come in handy from time to time. 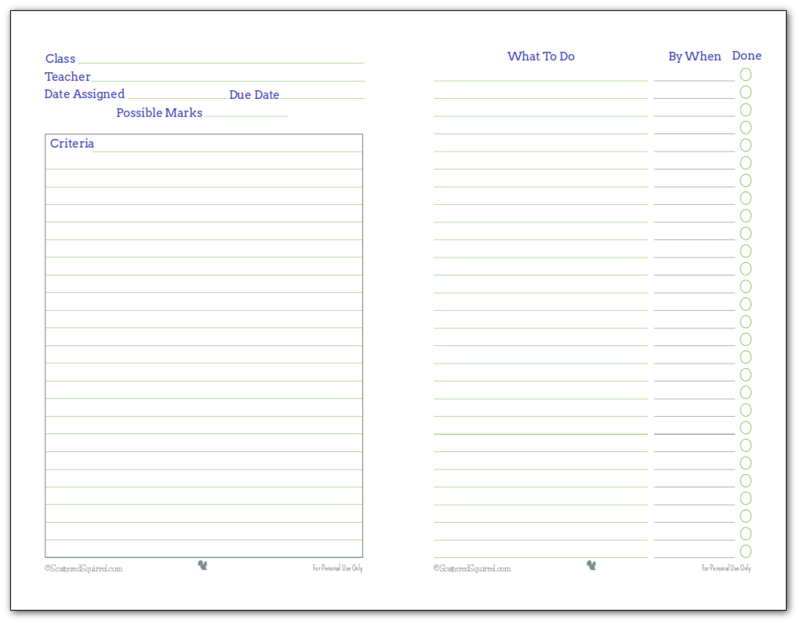 I can attest, though, that having that larger project planning page would have been amazing. 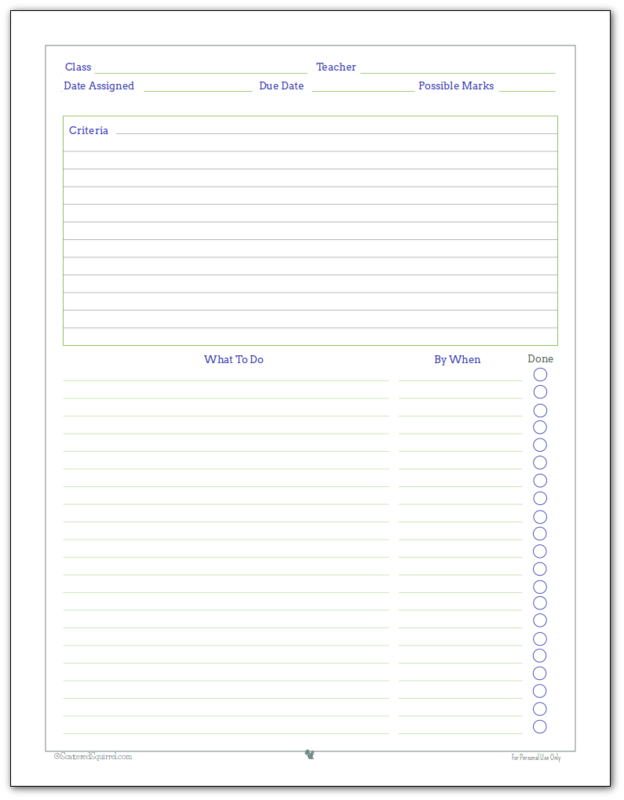 So many projects have multiple steps and requirements, and while the teacher instructions and/or printout are normally enough to know what you need to do, having some place to organize your ideas can be very handy! I wish I knew someone in school to pass these along to – though may just use them for my own projects and pretend the teacher bits, etc, aren’t there, ha! I would have been lost without my planner in highschool. I agree, I would have loved to have a project planner page in highschool. That would have been much more helpful than a planner I think. There were a to of larger projects that I ended up having to do. This is going to be very helpful for many students. 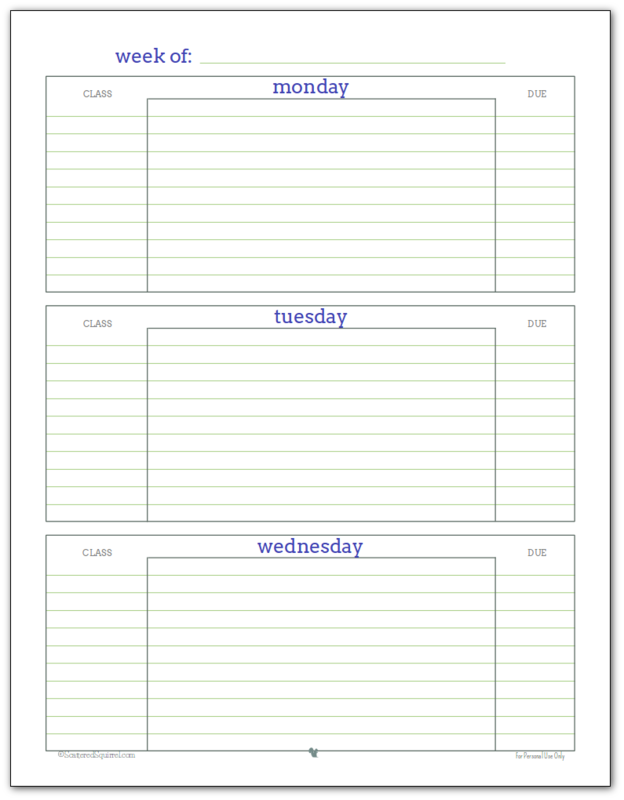 I think it is great to get into a habit of being organized when you are in school as it can help you throughout your work (and home) life. Thanks, Sheila! I hope at least few students find these helpful, trying to keep track of all those assignments can be a bit of a nightmare. Thanks for sharing. Thank you so much for these printables. 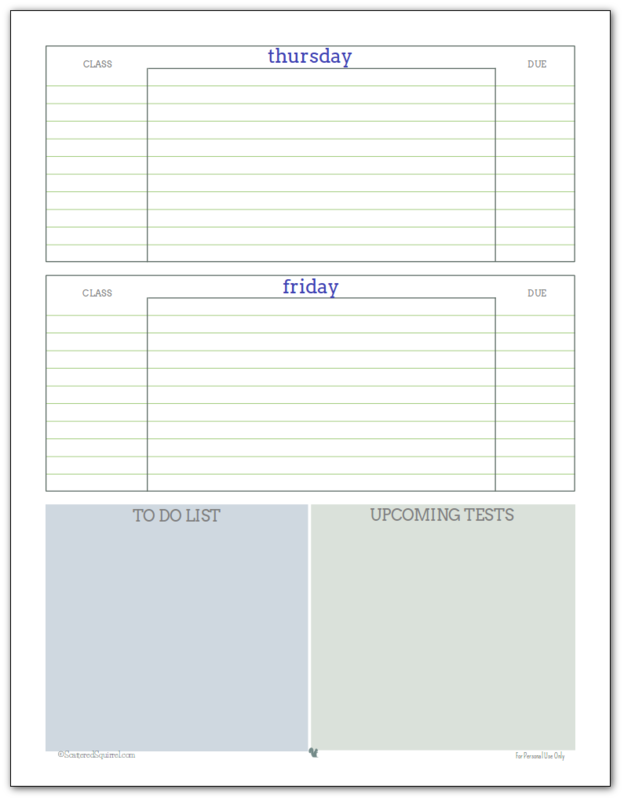 The layouts are perfect to help keep assignments straight. You’re welcome, I’m happy to hear that they’ll be useful for you. Music to my ears!!!! 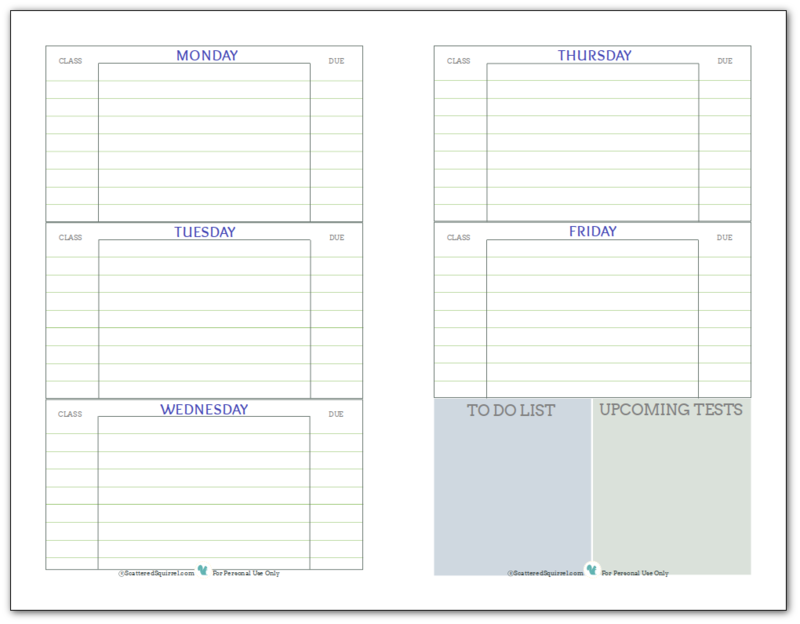 Any chance of a half-sized version of the weekly planner? My son is a senior and has been lax about his planner. Trying like mad to impart those “necessary for college survival” skills this year!!!! Thanks! Hi, Alli! I have no school age children in my home, but I do volunteer as a tutor for kids in my area. 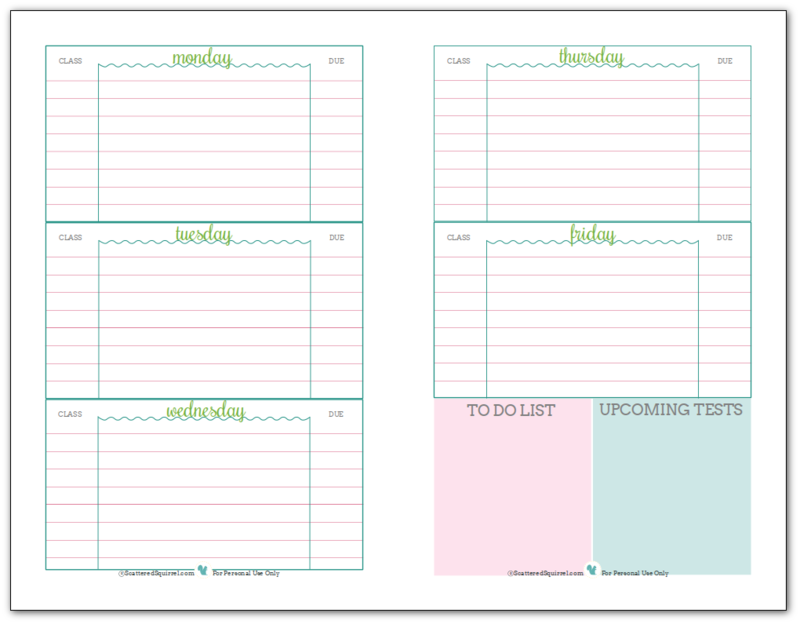 When I see hat a student’s problems could be largely remedied with some planning, I print out a month’s worth of planner pages and staple them into a booklet for the child to ‘test drive” and work with him or her to set the plans into motion. 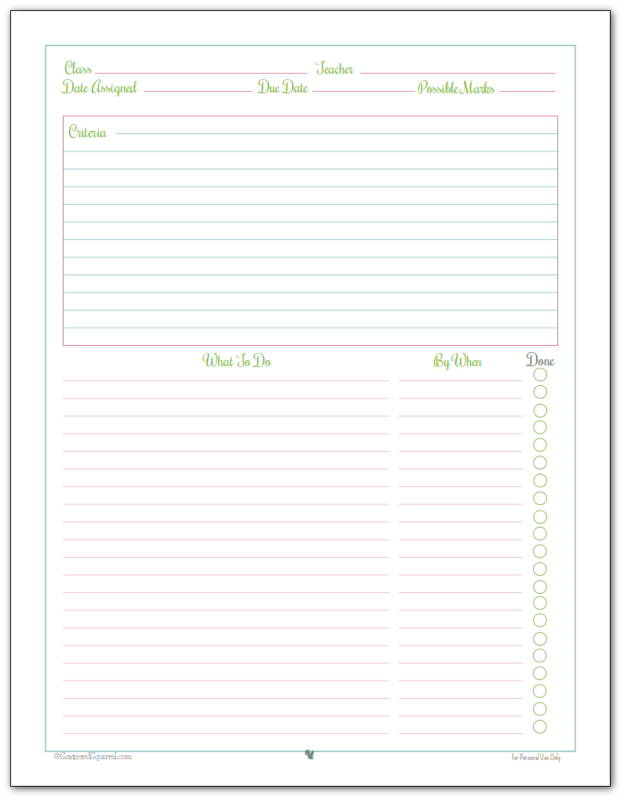 So many parents found out about this an d love the idea f using a student planner for the children that I am referring them to your blog to see what else they can find to resolve difficulties. 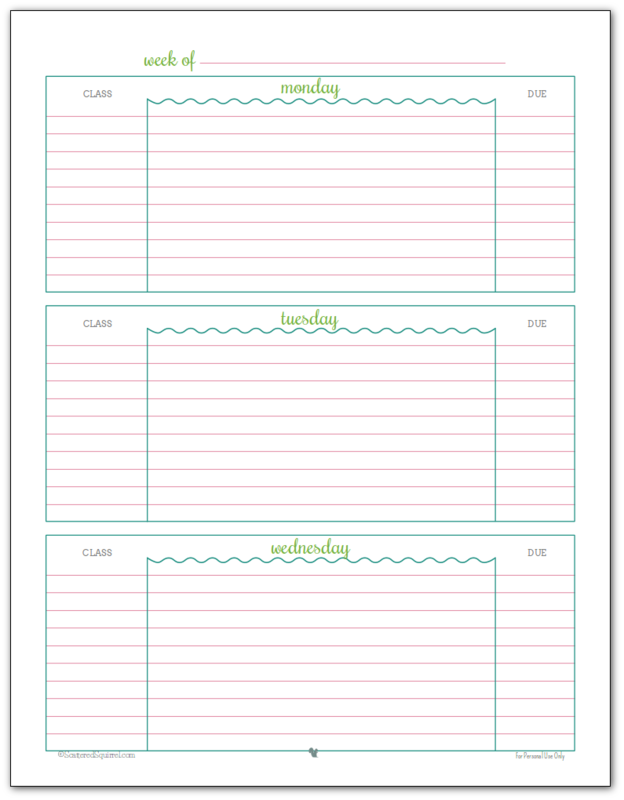 Many of the Moms and Dads are finding that they, too, benefit from planning their days, week, and months. Now that you are offering customized items, I will be referring more and more people t you. I will keep you busy and help others find their “planner peace”, too. 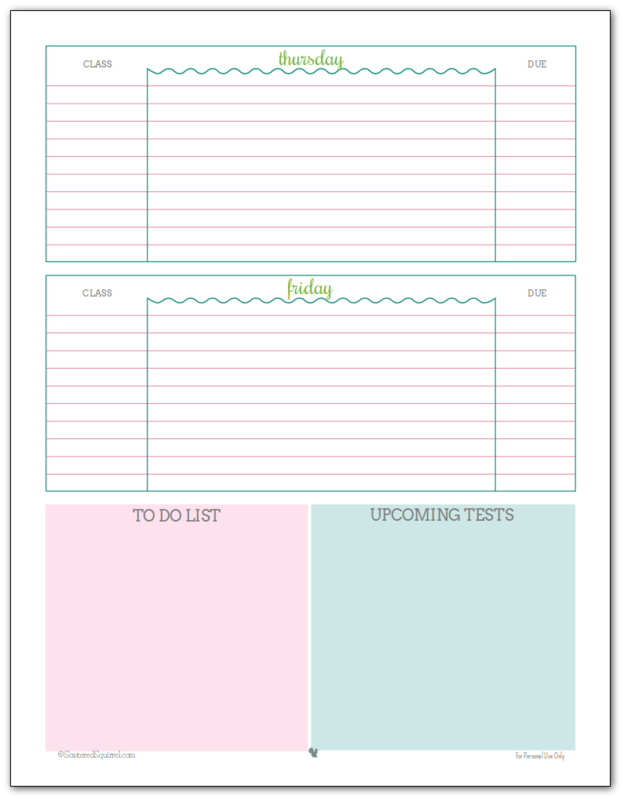 Hi Alli, My kids will be starting the third grade and I think these printables can help keep them organized and complete their homework. Heck, I can even use these to help keep on track 😉 I’m excited to give them a try. Thanks so much! My youngest is starting third grade too! 🙂 They grow up so fast don’t they? 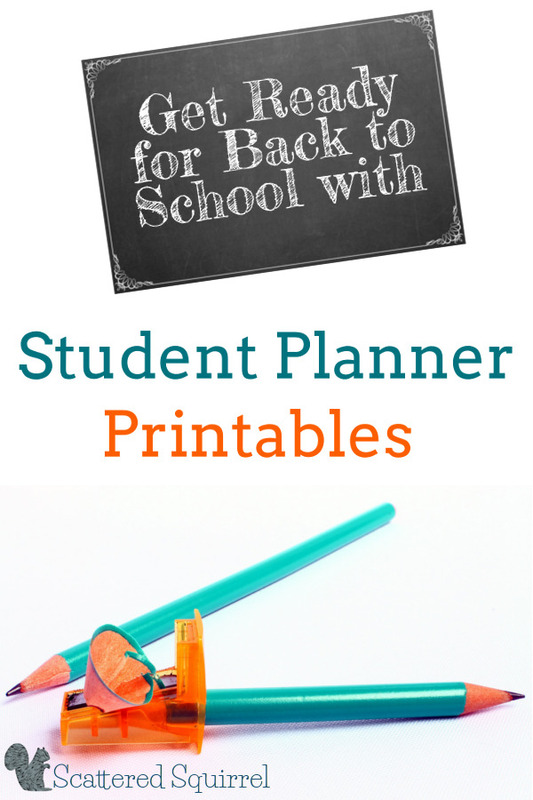 I’m happy to hear that the printables will be useful for your kiddos and yourself. I hope you all have fun using them. Thank you so much for sharing these! They are fantastic! Exactly what I was looking for.